Driving up energy efficiency has become a key performance indicator (KPI) driven focus within many datacentres. A datacentre is a managed environment and two of the key systems within a datacentre are its critical power and cooling systems. These two environment systems will draw the majority of power and can run to several hundred kVA or MW. At high power usage, a 1% improvement in energy efficiency can save the datacentre thousands in running costs. Uninterruptible power supplies sit within the critical power path of a datacentre. The role of a UPS system is to help stabilise the mains power supply and keep power up should the mains fail and until a local standby power generator is up and running. Traditional transformer-based and transformerless UPS systems would operate at around 80-90% in double-conversion on-line mode, and when operated with a 70-90% load. On-line mode is one of the three classes defined by EN/IEC 62040-3. The inverter powers the load with an AC supply, and is powered from a DC rail supported by a battery or UPS rectifier. The load is only every ‘exposed’ to the mains power supply if it the UPS system has to transfer to bypass mode (during an overload or UPS fault scenario). The latest transformerless UPS system designs have improved on-line double conversion operating efficiency. They can reach up to 96.5% and over a far wider load profile. Some modular UPS systems can run at 96.5% efficiency in on-line mode with a load profile down to as low as 20%. UPS system loading is important especially within a datacentre facility where some servers may be powered but not actually utilised within the data processing environment. 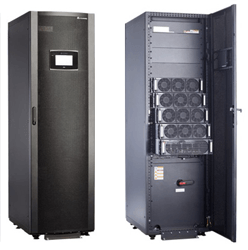 In datacentres with mixed load profiles and a need to expand rapidly, modular UPS systems are becoming the transformerless system of choice, compared to a fixed mono-block system. Expansion is achieved through additional ‘slide-in’ UPS modules. Most modern transformerless UPS systems now feature an Eco mode, allow the UPS system to reach an operating efficiency of 99%. When run in Eco-mode, the UPS system will run in one of the other UPS topologies described by EN/IEC 62040-3; line interactive or standby-off. Within the standard there is no actual definition of Eco-mode. So, when viewing claims of Eco mode UPS efficiency at 99% some discretion and scepticism is needed. It is important to accept that near 100% efficiency can only occur (for any system through which the energy is passing) if the UPS system itself is has negligible interaction, aside from using the highest efficiency design. For example, in Eco mode UPS systems, the inverter may be powered or idle. The load is connected to the bypass, which may or may not be filtered. The battery charger itself may be in sleep-mode, allowing the batteries to self-discharge over say a two-week period and then re-energising when the DC charge level falls below a pre-set threshold. Eco mode enabled UPS systems can reduce energy consumption within a datacentre by 2-3% but overall resilience should be looked on. There may be a break in power when the UPS inverter takes the load of several milliseconds. Whilst most datacentre servers and power supplies are far more tolerant of power variations, the load profile within a datacentre could be varied with a mixture of load types, load sizes, power factors and utilisation levels. Eco mode may only really be suitable for datacentres in areas with a robust mains power supply and fairly static loading profile and server utilisation levels. The best solution may be to put the UPS into automatic mode where it can select whether to run in full on-line or Eco mode or simply to invest in a high efficiency modular UPS system which will achieve not only 96.5% operating efficiency but allow vertical expansion through the addition of ‘slide-in’ power modules.